Tardigrades, also adorably known as water bears or moss piglets, are renowned for being almost indestructible. They are the only animal known to survive the cold vacuum of outer space, amongst other notable survival talents. A new discovery helps to cement their reputation as one of the most amazing animals on the planet. Researchers from the University of North Carolina at Chapel Hill have sequenced the tardigrade genome and found something they never expected: that they get a huge chunk of their genome – nearly one-sixth or 17.5 percent – from foreign DNA. The work, published in the Proceeding of the National Academy of Sciences, not only raises the question of whether there is a connection between foreign DNA and the ability to survive extreme environments, but further stretches conventional views of how DNA is inherited. First author Thomas Boothby, Goldstein and their collaborators revealed that tardigrades acquire about 6,000 foreign genes primarily from bacteria, but also from plants, fungi and Archaea, through a process called horizontal gene transfer – the swapping of genetic material between species as opposed to inheriting DNA exclusively from mom and dad. Previously another microscopic animal called the rotifer was the record-holder for having the most foreign DNA, but it has about half as much as the tardigrade. For comparison, most animals have less than one percent of their genome from foreign DNA. “Animals that can survive extreme stresses may be particularly prone to acquiring foreign genes — and bacterial genes might be better able to withstand stresses than animal ones,” said Boothby, a postdoctoral fellow in Goldstein’s lab. After all, bacteria have survived the Earth’s most extreme environments for billions of years. The team speculates that the DNA is getting into the genome randomly but what is being kept is what allows tardigrades to survive the harshest of environments, e.g. stick a tardigrade in a – 80 celsius freezer for a year or 10 and it starts running around in 20 minutes after thawing. 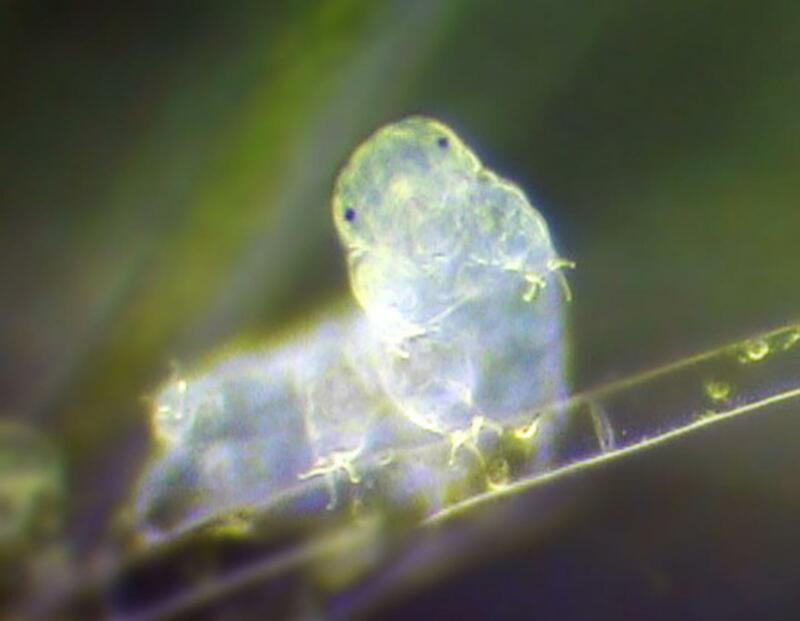 This is what the team thinks happens: when tardigrades are under conditions of extreme stress such as desiccation – or a state of extreme dryness — Boothby and Goldstein believe that the tardigrade’s DNA breaks into tiny pieces. When the cell rehydrates, the cell’s membrane and nucleus, where the DNA resides, becomes temporarily leaky and DNA and other large molecules can pass through easily. Tardigrades not only can repair their own damaged DNA as the cell rehydrates but also stitch in the foreign DNA in the process, creating a mosaic of genes that come from different species. Since this article was originally published, a new genome study has cast doubt on the amount of foreign DNA that is actually present in tardigrades. The second paper finds no support for massive horizontal gene transfer, and suggests that perhaps contamination contributes to the original paper’s findings.